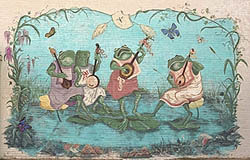 "We had our 26th annual Frog Festival during Labor Day weekend, 1998. About 75,000 people attended over the course of three days. The big draw is the musical entertainment because we live in southwest Louisiana Cajun country. At the Festival, people sell wares; we've got big amusement rides that attract children; there's the queen's contest and the frog-jumping contest; there's the Lion's Club Frog Derby where little girls dress frogs up in costumes and jump them for distance -- that's real unique. And there's crawling races for little babies. All of this is typical of a country fair, I guess." "My name is Claire Elizabeth Trahan. I'm Miss Rayne 1998-1999, and I have lived here all my life; we have pictures of me at my first Frog Festival holding a frog. My duty as Miss Rayne is to promote both the city of Rayne and tourism whenever I'm called upon. I visit area festivals and towns. At grand openings, parades, and other events I'm called upon to be the official spokesperson. Miss Rayne is chosen every year in August. I had to wear an evening gown and compete against nine other girls. The competition consisted of an interview during which judges asked us about our knowledge of the town, our attitude toward the future, and future endeavors. We also had an on-stage interview question. In addition to the Miss Rayne competition, there's a Frog Derby pageant that I've competed in. It also takes place during the Frog Festival. A Frog Derby is like a horse race except it's with frogs. A bunch of girls get together and jump frogs; that's part of the pageant competition. We dress the frogs up in little jockey uniforms and we get them to jump. They are usually kept in a cage, so by the time we take them out they are ready to jump. We usually just have to tap the ground near them and they're off. The Derby Queen isn't chosen by how far her frog jumps, but part of the competition consists of the longest and farthest jump. I'm really proud that Rayne is the Frog Capital of the World because I think it is truly unique and we're nationally known because of it. And frogs are just not ordinary animals. Frogs are very dear to us. Even though most people think they are slimy and gross, we love them."